Saturday April 3rd 1920 Bro Rob birthday. I went down and helped Fannie till two oclock. Later Hattie & I rode to town with She and William. Spent evening at home. Hattie in town with Cora to a picture show. I sewed tatting on apron. Still cold. Sunday April 4th 1920 Very cold. The folks all went to church "Easter Sunday" I read awhile after dinner. Then went riding with Ott family. Hattie to town after supper. Rob & Cora over before. Cora not well. I read. So lonesome. Monday April 5th 1920 Plenty of ice this morning. I was down to Fannies a little while. Cora at home sick all day. Hattie to town in afternoon. I had a letter from Lydia. The girls both have their schools again for next year with fine increase in salary. How glad I would be to read the letter to Will. I wrote Ida in afternoon. 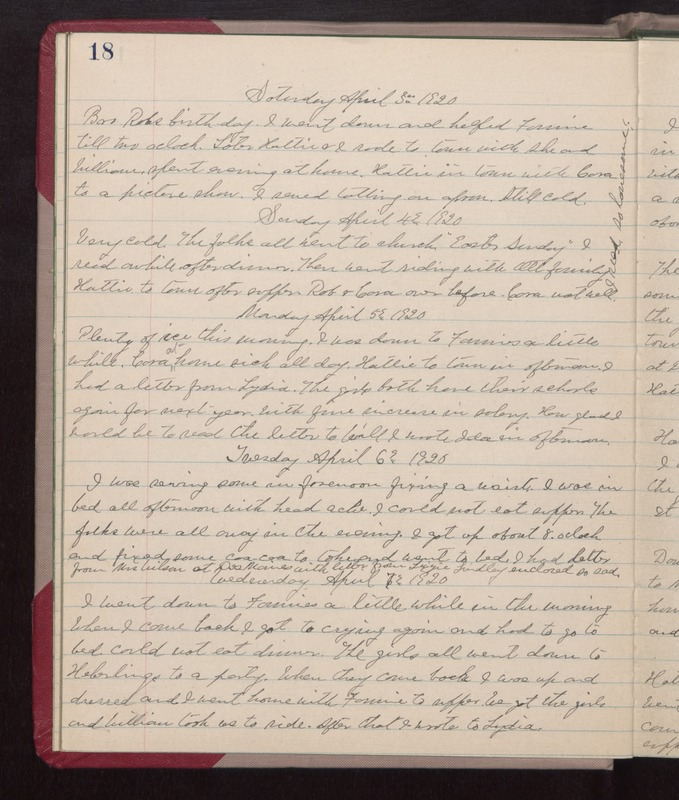 Tuesday April 6th 1920 I was sewing some in forenoon fixing a waist. I was in bed all afternoon with head ache. I could not eat supper. The folks were all away in the evening. I got up about 8 oclock and fixed some cocoa to take and went to bed. I had letter from Mrs Wilson at Des Moines with letter from Lizzie Lindley enclosed, so sad. Wednesday April 7th 1920 I went down to Fannies a little while in the morning. When I came back I got to crying again and had to go to bed, could not eat dinner. The girls all went down to Heberlings to a party. When they came back I was up and dressed and I went home with Fannie to supper. We got the girls and William took us to ride. After that I wrote to Lydia.